Proving that Trualta’s program reduces cost and improves outcomes. We have researched the family caregiver experience extensively from the perspective of families as well as clinicians. Through co-design with stakeholders, we validate the usability of the platform, the delivery of content, and the feasibility of improving health-related outcomes. In one study of payment-induced family care (Medicaid Cash & Counseling), family involvement decreased the likelihood of using the emergency room by 30% and the number of inpatient days by 13 days. Across 4,000+ hospitals in the HCAHPS 2017 Care Transitions composite, including questions about communication and discharge information, only 53% of respondents reported a top-box score – representing a significant opportunity to differentiate. In one publicly funded system, home care costs $42/day, a third of the $126/day in long-term care – if there is even a bed available. Enabling families to become confident and competent caregivers is critical to extending time at home. Our research partners at the Center for Aging + Brain Health Innovation at Baycrest have funded a match control trial with 100+ family caregivers at the University of Florida. 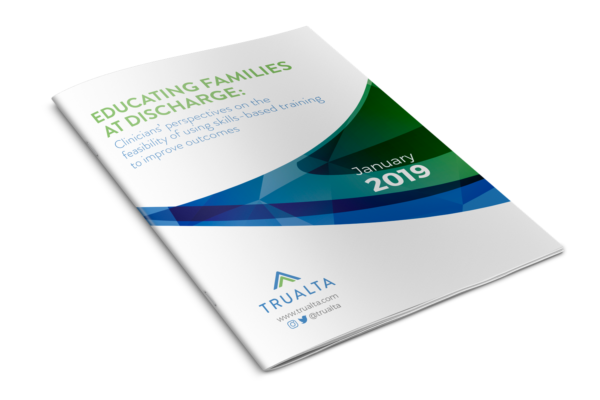 We are following families caring for a loved one with dementia for 6+ months to understand how Trualta’s educational intervention can reduce caregiver burden and improve care. Using a variety of existing caregiver assessment tools, self-reported surveys and system-generated engagement data. Including healthcare outcomes such as fewer falls, reduced readmission and infection rates, and increased time living independently. Including improvements to continuity of care, discharge process and information transfer. Our Toronto office is connected to St. Michael’s Hospital, where we are a member of the Biomedical Zone accelerator and have access to clinicians and patients to strengthen our evidence base. Trualta is a personalized, skills-based training platform for family members caring for aging loved ones living at home.